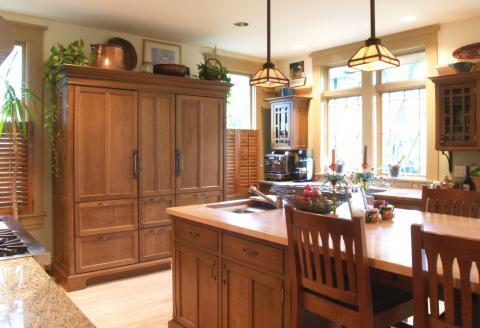 YesterTec makes many independent workstations that include hidden ovens, cooktops, refrigerators and pantries. But sometimes there is a need to combine more functions into a single piece. 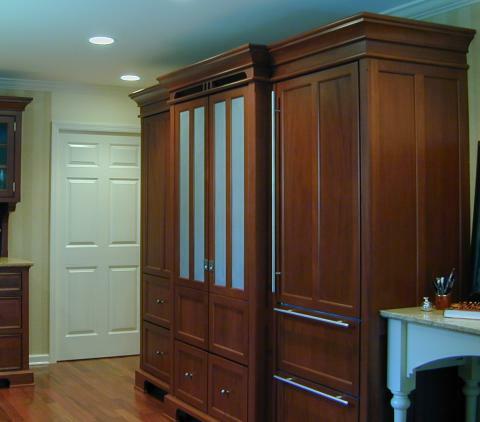 Usually it is a lack of overall wall space that determines the need to combine several functions together. The large armoire shown above was created by combining a double oven piesafe (in the middle) with a Subzero refrigerator (on the right) and a full height pantry (on the left). This article on our website describes the workstation in detail and illustrates what it contains. 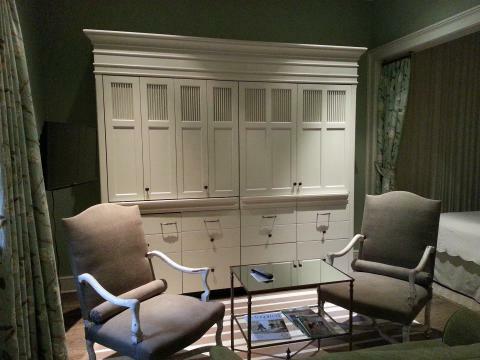 The hotel room above needed a small mini-kitchen and a wardrobe to be combined into one piece. 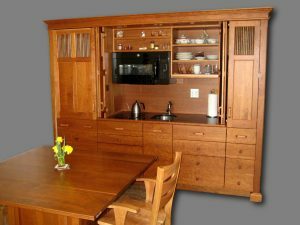 So the left side conceals a complete kitchen (without a dishwasher) and the right side conceals hanging space above a dresser below. This combination allows the room to have an uncluttered look while creating a focal point at the same time. Of course, there are many other models that combine several functions into one piece.The SZ15-RP95 Pine Armoire above combines a 15 Cu. Ft. Subzero Refrigerator Freezer with a huge pantry. The kitchen above features two combined workstations. 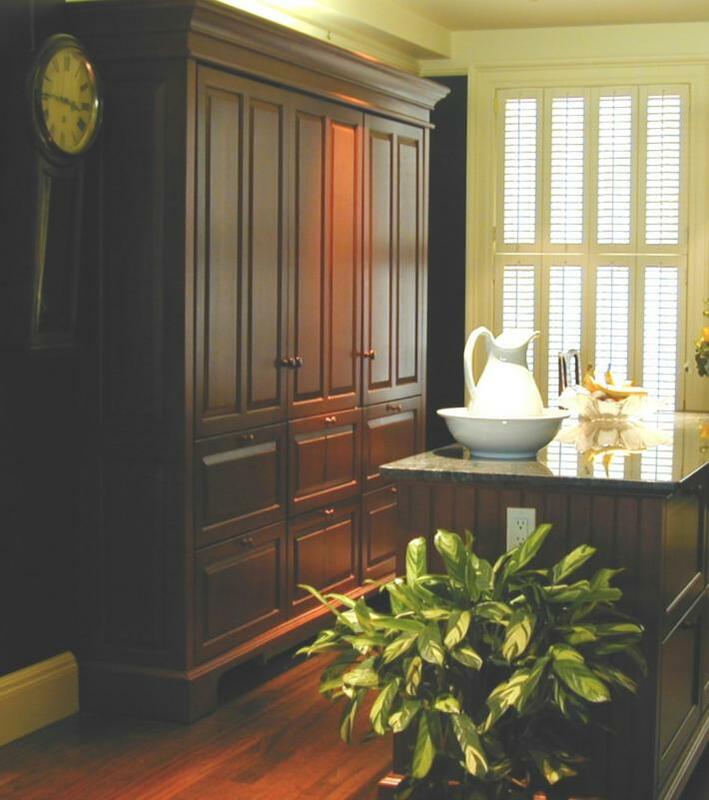 The armoire flanks a full height pantry with two Subzero refrigeration units. The island combines two B48 island units placed back to back with a prep / bar sink shared between them. A table frame was added and then the entire counter top / table top surface was unified with a butcher block top. The natural cherry mini-kitchen above is flanked by a full height refrigerator on the left and a full height storage pantry on the right. We call it a Master Kitchen. 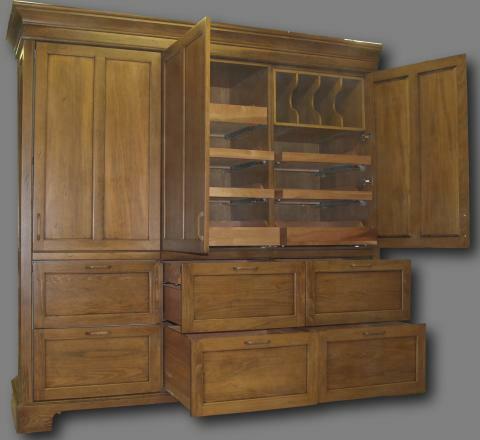 So whether you need to combine several functions into an armoire or create a large central island, there are most likely some YesterTec models that will satisfy your needs. And now our many models are available for you to see in our digital PDF catalog. Using the catalog and this website, we can help you find the most appropriate solution for your design.